I love to browse Etsy. As of right now, there are 1336 items in my list of Items I Love with even more in several other lists. I’d love to own every single one of them, but at the same time then I’d have to figure out where to put them, so it’s probably best to collect them in my lists and treasuries. 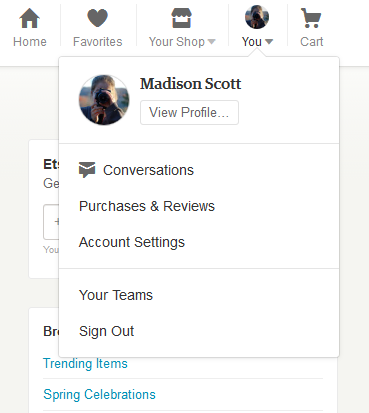 But browsing Etsy? My favorite. 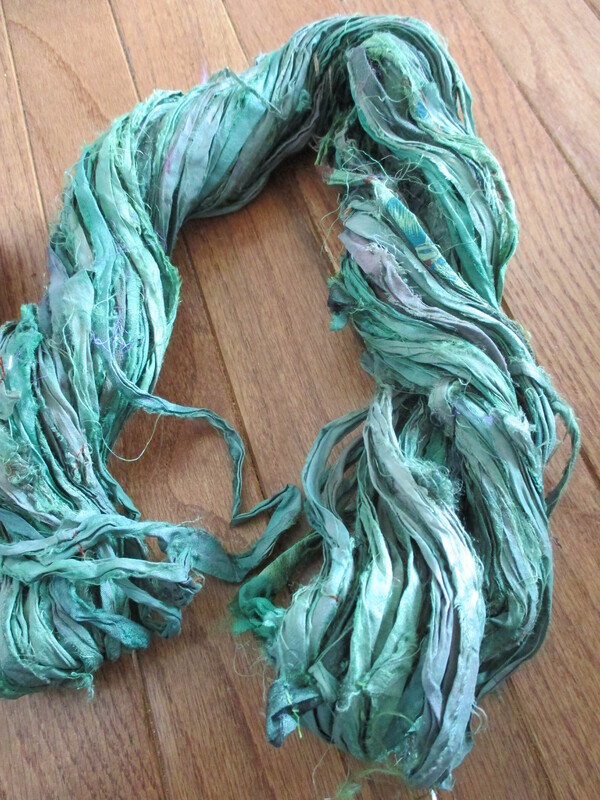 Finding new yarns I have yet to work with? My favorite. One thing I notice through all of this browsing is that most – if not all – Etsy shops have made many, many more sales than their reviews will show. It doesn’t matter the size of the shop, they will not have as many reviews as they have sales, or even anywhere close to that number. From my own experience I’ve discovered that many people don’t know how to leave a review. It’s very simple, a series of clicks, but it’s knowing the series and the number and where exactly you’re supposed to end up. 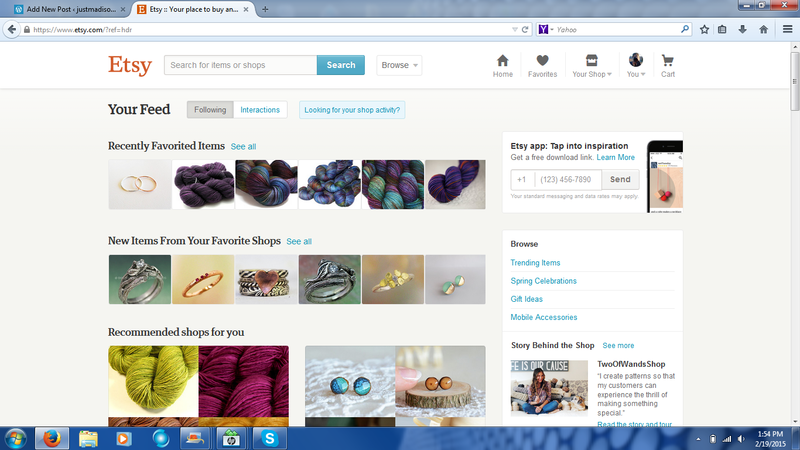 Step One – Log into Etsy.com. You should immediately see your homepage. Here’s mine today. 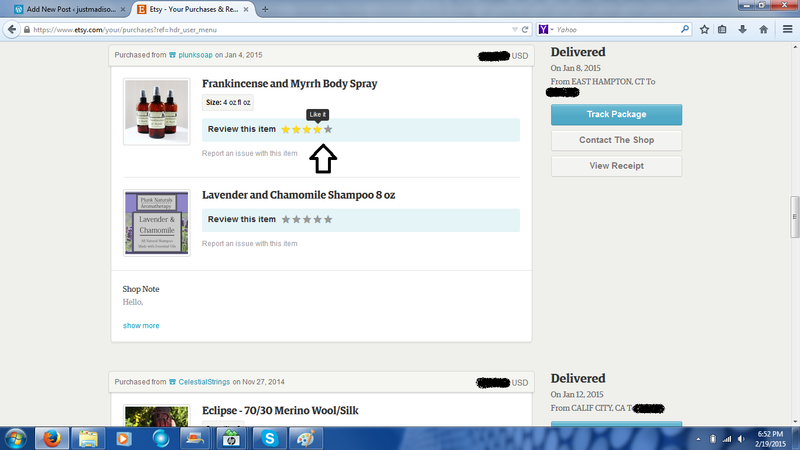 Scroll downward to the item(s) you would like to review. Sometimes there is a wait period before you are allowed to review an item (even an instant download), so if the owner of the shop is a quick shipper and you absolutely love your purchase, you might still have to wait a few days to leave a review. These are earrings I’ve purchased from Juniper and Ivy. 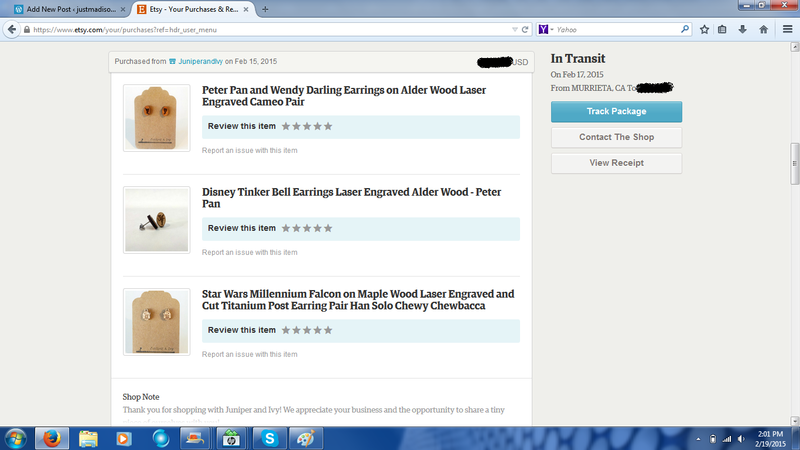 They are still marked as in transit, but I’m able to leave a review if I so choose. 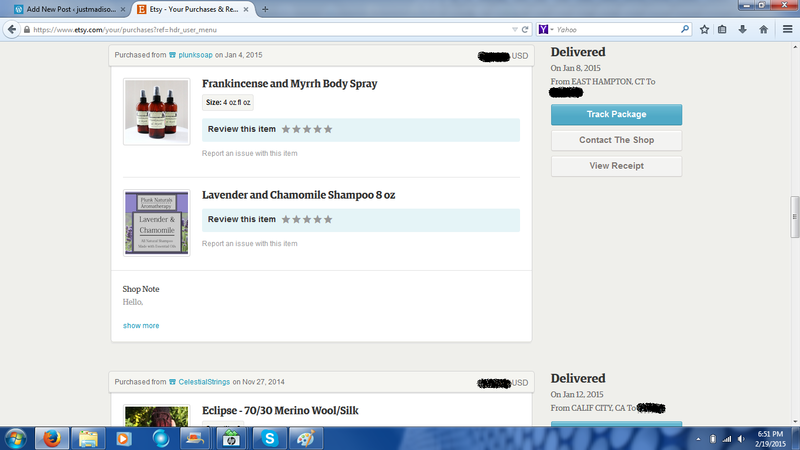 I prefer to review items I’ve received and sampled, so I’ll skip over the earrings and move to the next order. 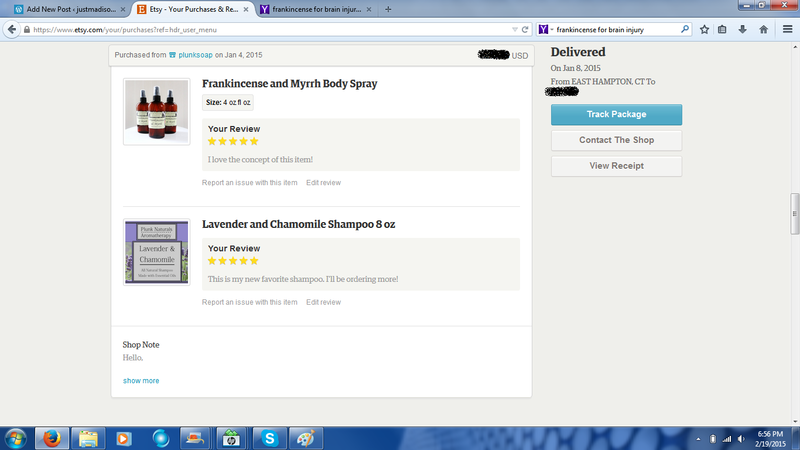 Frankincense and Myrrh Body Spray and Lavender and Chamomile Shampoo from Plunk Soap. 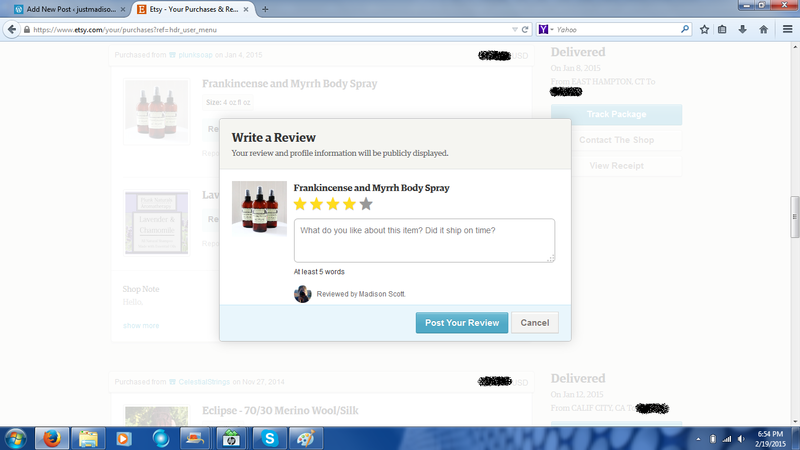 Before you can actually write a review, you must click the number of stars you would rate the product. 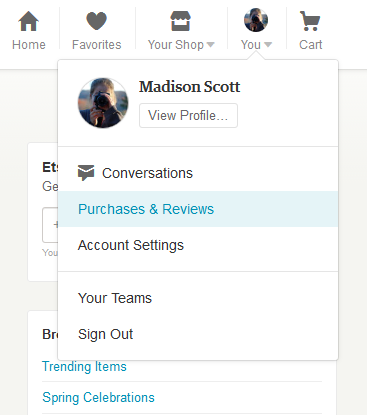 You can change the number of stars at any point in the review process, or even later if you become dissatisfied with the product. Each item in the order must be reviewed individually. Every honest review you leave helps a shop owner out. It also assists their future customers. For many, positive reviews can be the deciding factor when choosing to make a purchase. Don’t let the lack of know-how keep you from reviewing something you love or something you hate, go do it! And remember, many shops offer discount codes to those who take the time to leave a few stars. Do we ever keep our resolutions? In the past, I have resolved to get organized, to stay organized, to eat better, to exercise more, to lose weight, to destash my stashes, to cut down on my clutter, to start and finish my Christmas shopping early, to blog more, to keep my journal updated with happy things, and I have failed. So this year I’m going to make it easy. I resolve to be happy, to cut back on stresses, to stop feeling guilty for saying no, I don’t want to. I resolve to communicate more, whether it is here, with my family, or with my friends. I resolve to make more than I buy, to use my cameras more often, and to strongly consider the benefits of a smoothie with/for breakfast. I resolve to consume more vitamin C, and to teach more things more often. And to finish my Christmas shopping early. I remember visiting fabric stores with my momma when I was little. “I’m going to make you a dress,” she’d say. “But first we have to pick out a pattern.” We’d go through pattern book after pattern book. She’d see something cute and point it out to me. 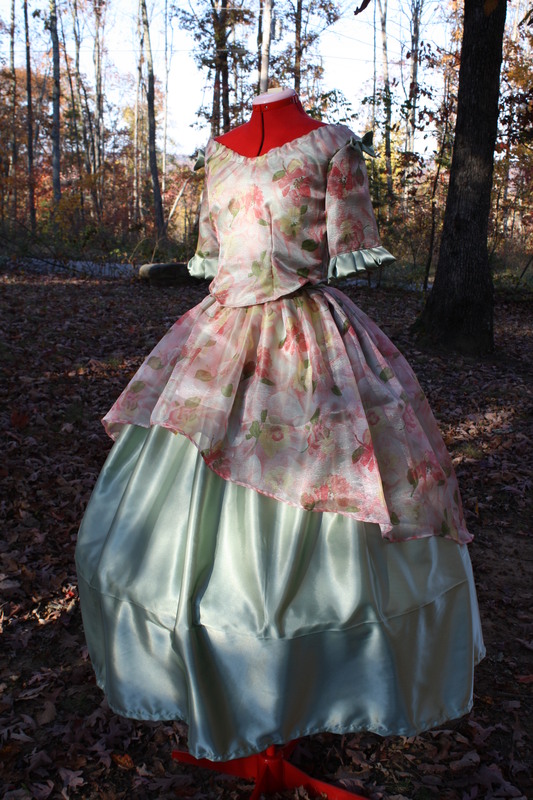 I’d say no, I didn’t like the color, or the print, or too many flowers. Because the picture was made in a fabric that didn’t suit my tastes, I would rule the pattern out completely and keep looking. Most of the time we both ended up frustrated. Sometimes she would find a pattern she liked and we’d go straight to picking out material. It was years before she made me realize that I was only supposed to be looking at the shape of the dress, that the rest was completely up to our discretion and we could do whatever we wanted. I like to think that I’m better about that now. I like the freedom of being able to take what I want and like about a pattern and change all the rest of it. I have an easier time doing that when it comes to sewing. This dress is a perfect example. The inspiration was white and blue. I was presented with green satin. I had some very overwhelming pink organza. I love how it turned out, and so did the owner. 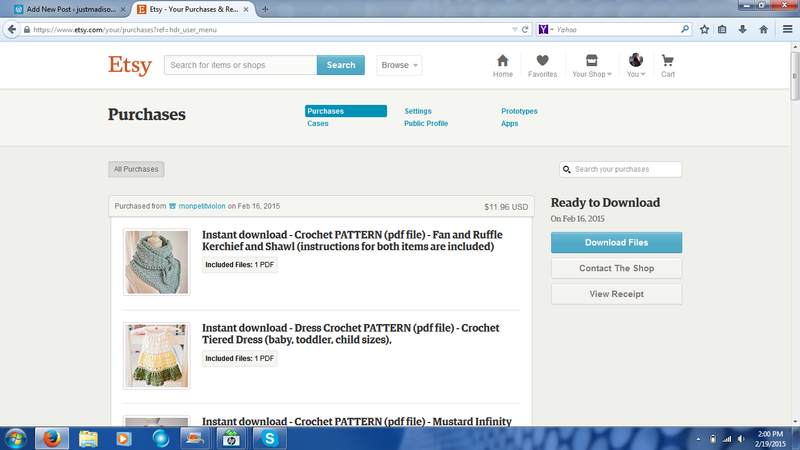 Crochet patterns are ever challenging though. I see a gorgeous pattern, and I love everything about it. Then I look at my yarn stash, and see nothing that will do justice to that pattern. 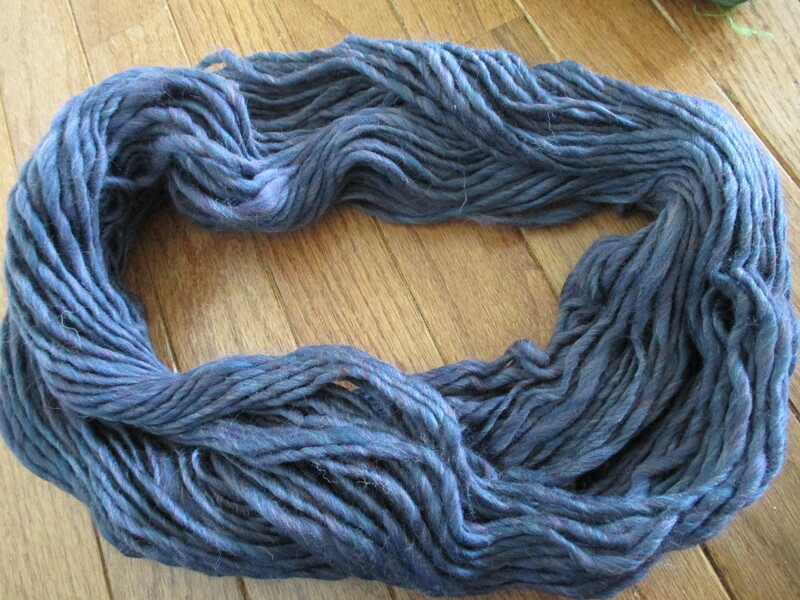 Much of my stash is a collection of hand-dyed single skeins. They are the most beautiful yarns I’ve ever seen, but finding the perfect patterns to showcase their beauty is difficult. 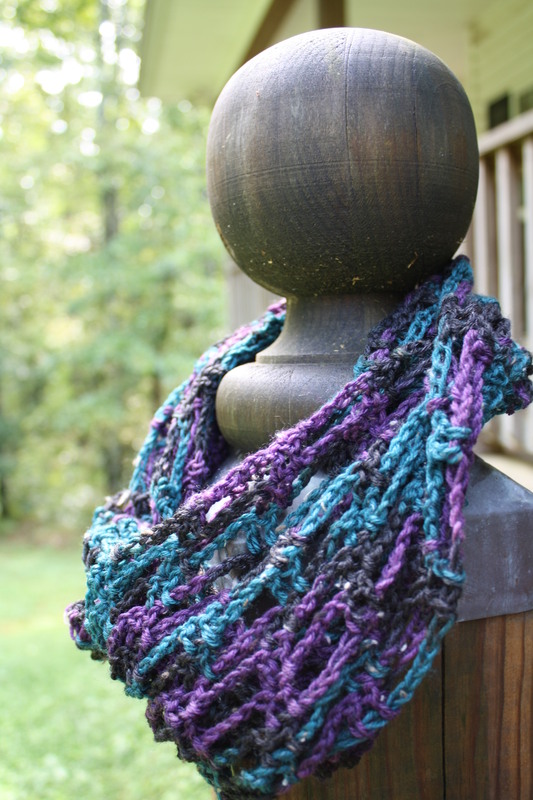 To that end, I will be showcasing my collection of one-skein patterns. Many that I have used, many that are in my ravelry queue. 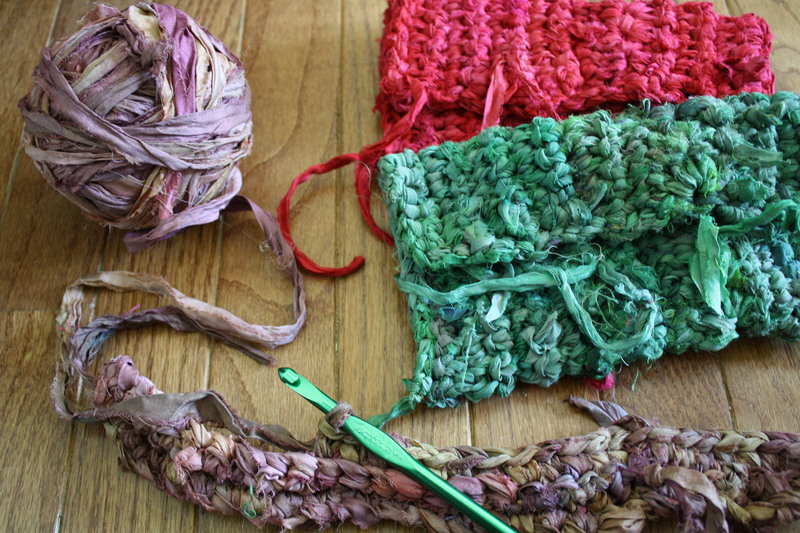 Reviews will be provided where appropriate, of both pattern and yarn. My work schedule is about to get crazy with the upcoming holiday season, so hopefully this will provide an opportunity to reflect. I’ve always found it particularly difficult to blog during the summer. There’s always something to do. This year my something to do was taking a break from everything except work in an effort to deal with stresses. I did quite a bit of creating over the summer (though I’m now on forced hiatus from that so I can make myself accomplish several time-sensitive projects) so I’ll hopefully have several yarn and pattern reviews coming up and several other things as well. Sometimes a girl just needs a break. My need came from six-day workweeks, from stressful jobs and coworkers, from not enough sleep and too much on my to-do list and laundry that simply wasn’t getting caught up. The creating didn’t stop though, as the following images can attest. Also from Yarn Baby, this is a Polwarth Wool which perfectly matches my bedspread. It has been cowled, and I LOVE it. 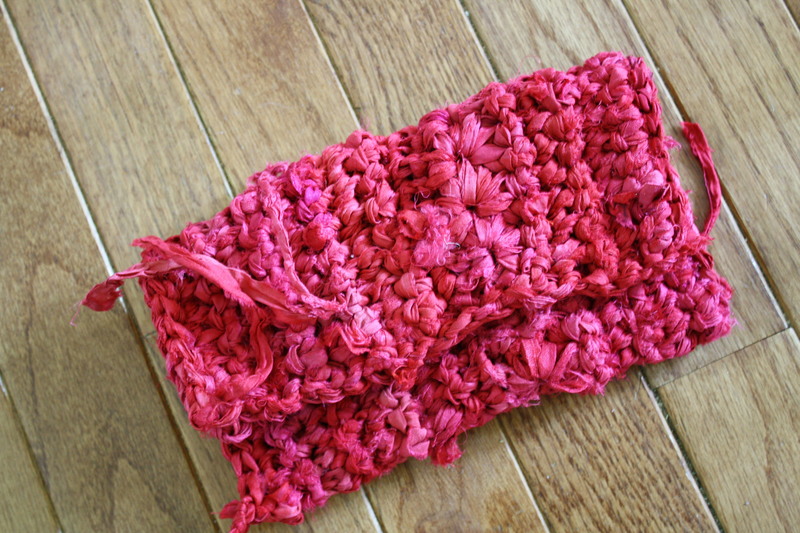 I’m hoping to get a pattern review up soon because it is gorgeous. 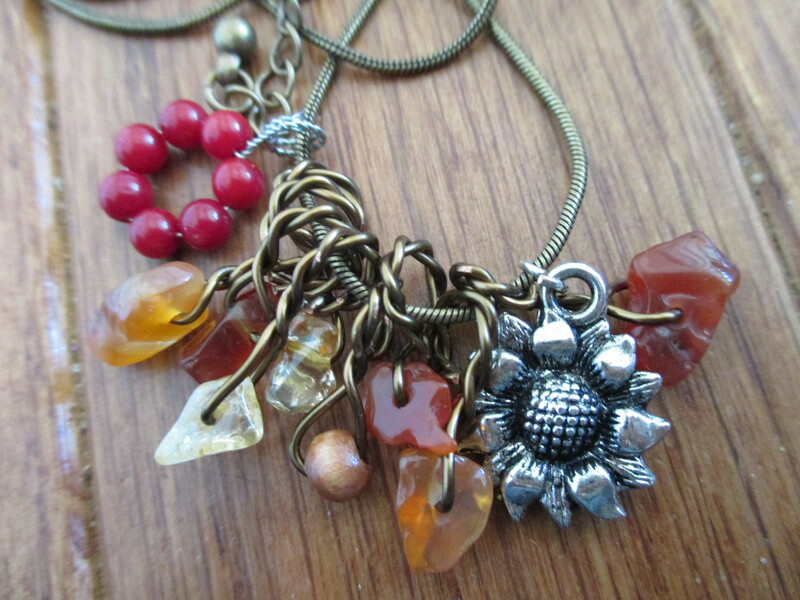 This is my Shades of Sunflowers necklace (now available on Etsy). Malachite, shell and wooden beads hand-wrapped in brass wire are set off by a silver-tone sunflower charm. 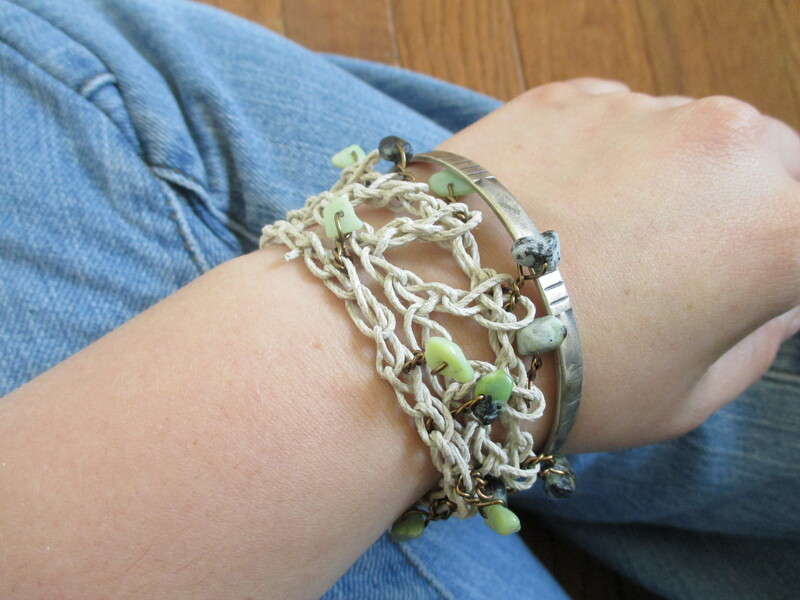 I love this bracelet! 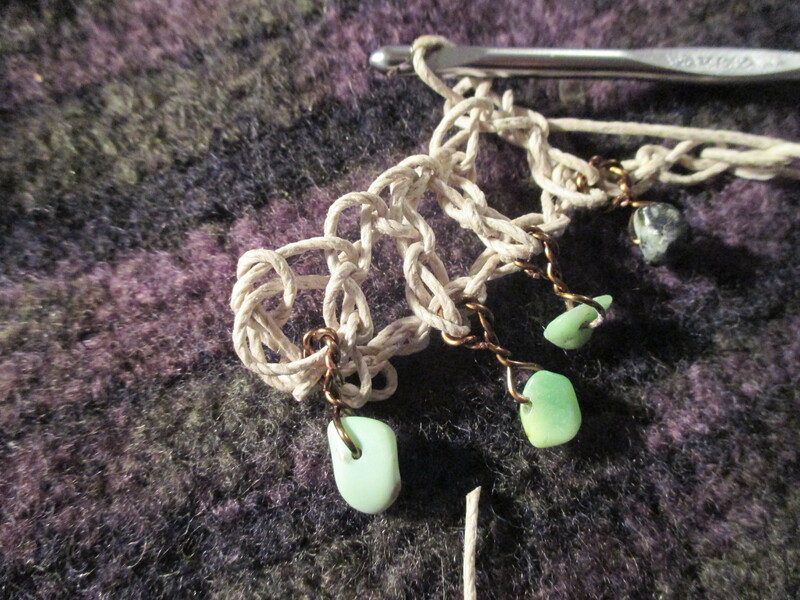 Hemp, malachite and brass wire, crocheted together for a beachy, summery wrap bracelet. It’ll be available on Etsy soon, I hope. 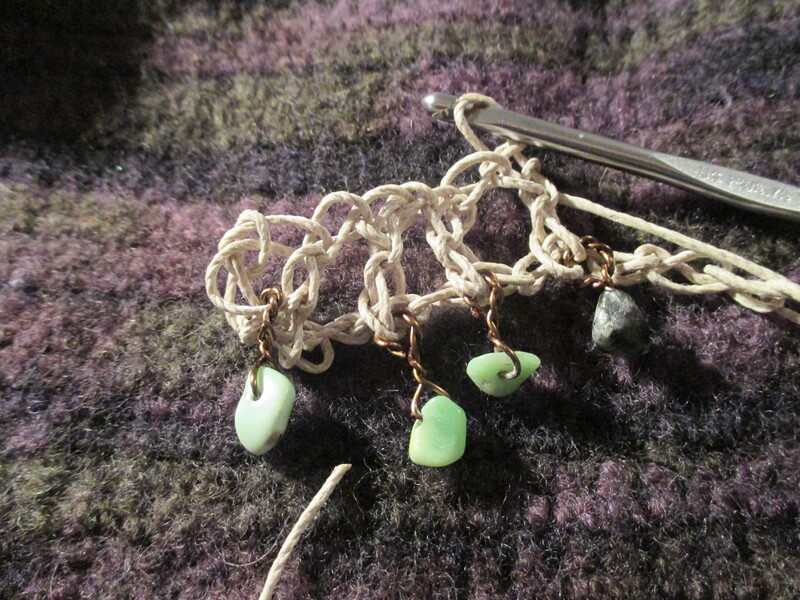 I have several “new” projects in the works, a few original patterns, etc. I’ll try to stay on top of those while keeping y’all updated on Craft Show planning! I’m so excited about warm weather I can’t stop working with lightweight summery things. This is the newest and I can’t wait to see how it comes out!